On the 2nd day after coming home (I mean, apartment room), I had this sudden craving for broccoli-- more precisely, broccoli potage -- and cheese. I had no idea why, though. My sense of taste was still messed up and I couldn’t stand the taste of some food I usually love – like apple cake. I had baked bunch of apple cakes and froze them before being hospitalized. But when I tried it first time after coming back, the buttery flavor of the cake and the slight sourness from the apple chunks almost made me nauseate. (What a shame!! I spent so much time baking them when I was terribly busy getting so many things done before going to the hospital.) Instead, what I really wanted was broccoli & cheese… and some good bread which is not too buttery or sweet. For a few days after that, I enjoyed broccoli potage topped with grated cheese (I know this may sound strange, but I really wanted cheese flavor added) again and again, and each time all I had to do was just defrosting and heating up the frozen potage. With onion, potato, garlic and soy milk added, I think the liquid food was pretty nutritious. But I still don’t know why I craved specifically for broccoli so badly and why I had no problem with garlic while the smell of ginger bothered me so much, and also why black pepper and bay leaves were OK when the smell of cinnamon, clove and celery almost killed me. It's funny what food you crave when you're recovering from illness. When I'm sick I only want to eat grapes or watermelon for a day. Oh, iron. Yeah, that makes sense… because I lost some blood during the surgery. Thanks. I guess my taste buds are OK now, since the oatmeal raisin cookies tasted good when I tried them today. It's good to see that you're doing better, although I'm sorry your sense of taste is still messed up. I hope you recover fully soon. 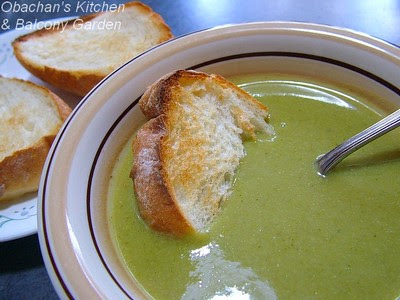 By the way the broccoli potage looks great! That looks oishii! I'm glad you are back home and recovering well, obachan. That’s very nice of you. 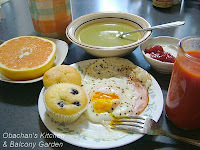 I have a confession… Yesterday (June 8th) I made broccoli potage again, using the same recipe. But it didn’t taste as good as it did before. I guess my taste buds were really messed up.